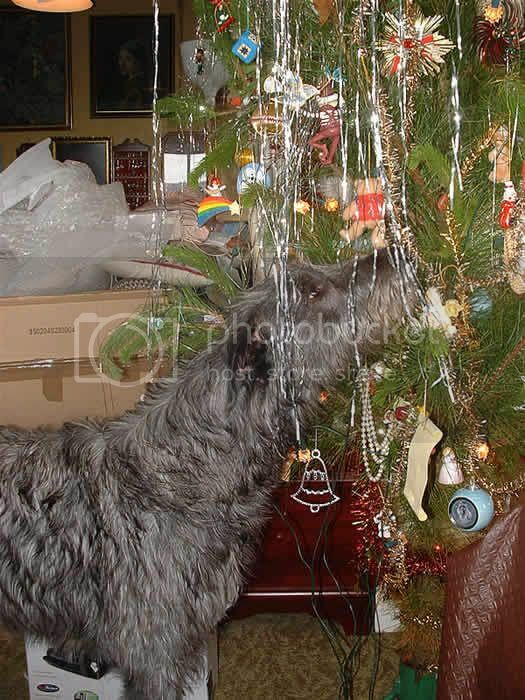 Teratyke created the topic: Festive Hound Photos. I thought it would be nice to have a nice Christmas scene on the front page. It would be great to see Christmas scenes from the different climates we have amongst our members. We might pick out two winners if we end up with both funny and scenic entries. I'll need to get this done by early December so its either out with the tinsel early, or send in photos from earlier years. 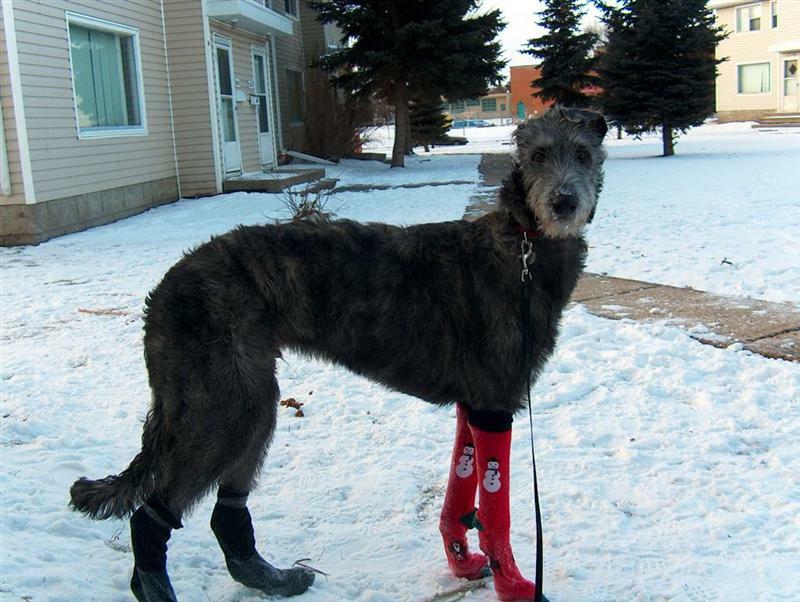 If Christmas isn't your thing then you can still send in photos of your hounds at this time of year. As always a front page spot will (possibly) catapult the winner into a life of fame and fortune! Any problems submitting your photos, just ask here or contact me and I can post them for you. 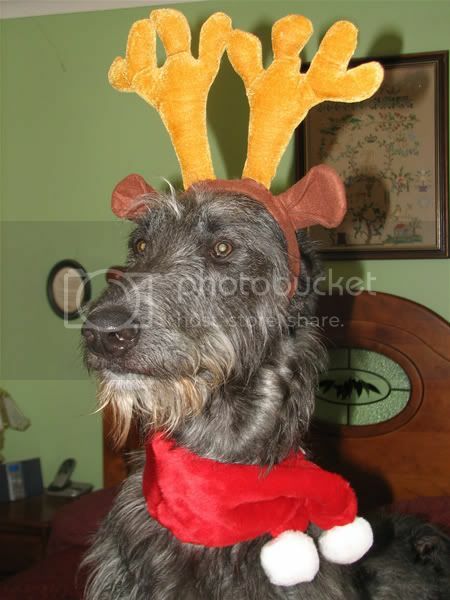 cassandra1260 replied the topic: Re:Festive Hound Photos. 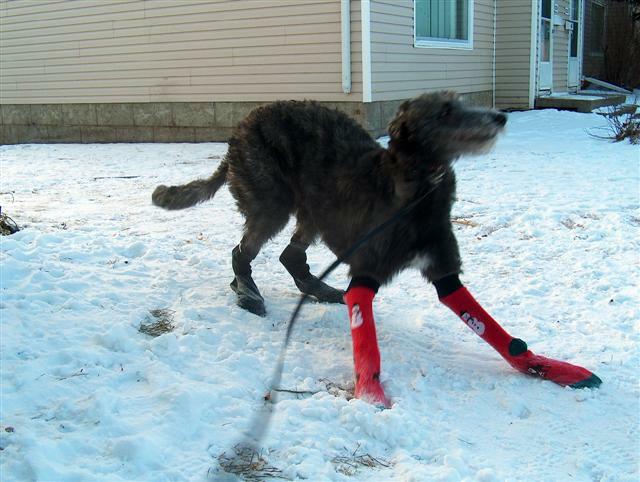 This was from last winter...I'll do new ones when we get snow...he loves the snow! 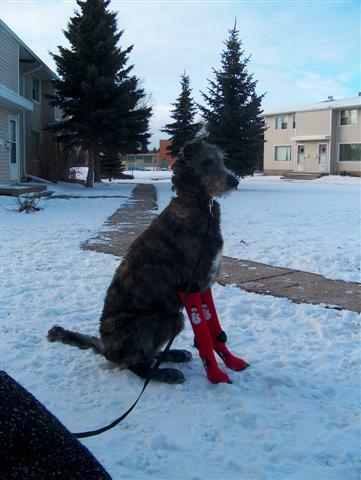 I didn't want Zippo to get cold feet when it was -23...so socks w/ santa came in hand. 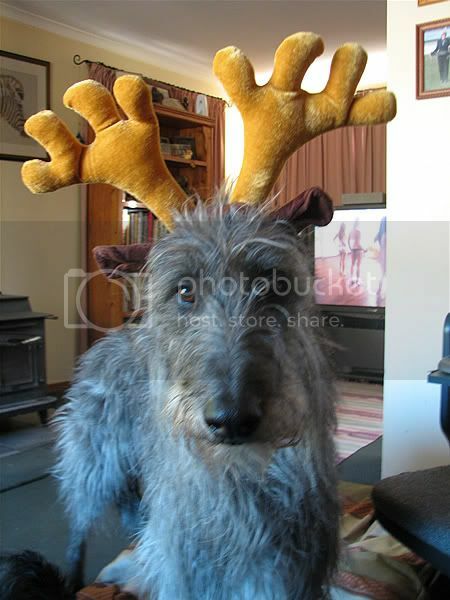 Teratyke replied the topic: Re:Festive Hound Photos. Thank you..glad he didn't mind the cold. such a funny little guy! 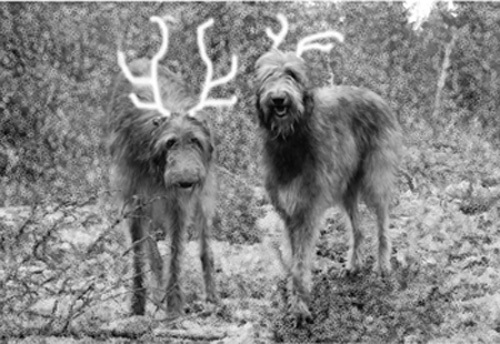 Lurch8252 replied the topic: Re:Festive Hound Photos. I love em, they are brilliant, he doesn't mind a bit either!!! Thanks, he is fun to play with..I bought him a jacket with reflective stripes on it, so when we walk at night he can be seen. Now to find an Angel suit..might have to make it. I can't resist sharing these..hope no one minds all the pics..glad to have an apprciative audience..my relatives are probably getting tired of me sending only Zippo pics. 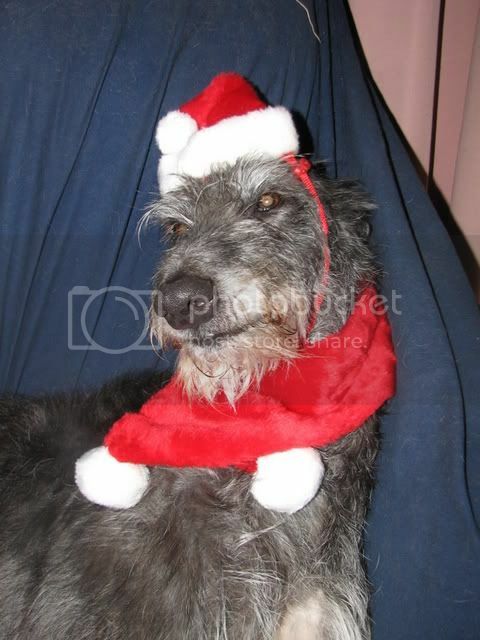 hermitkat replied the topic: Re:Festive Hound Photos. Oh WOW..what magic shots.I envy the gorgeous coats dogs from colder climates seem to have!! If you have any Christmas pictures from a hotter climate they would be just as good to see! Brollachan replied the topic: Re:Festive Hound Photos. Oh..wow..I love it..what a great way to wake up....someone with the abiltiy and equipment should make Christmas cards. In my borzoi yrs..I was able to purchase Christmas cards with Santa's led by a Borzoi...still have it on my fridge during the season. I have wondered how to switch the Borzoi for Zippo on the picture. I'd certainly buy a pack of cards like that. miia replied the topic: Re:Festive Hound Photos. Two real Santa's helpers from Finland.I told my 5-year old niece last X-mas that she should be looking at night sky in the Christmas eve (Here Santa will arrive with presents on 24th eve). Santa has been so busy that he had asked Manu and Unski (in photo) to help him with the sledge among the other of his reindeer. Little girl then had tens of presents but had been really disappointed that missed an occasion to see boys in their X-mas duty. Love the black and white photo. Very classic...so much fun to see the dogs enjoy our fun with them. They are sooo tolerant...such good hounds. CiCoch replied the topic: Re:Festive Hound Photos. Thanks for all the entries. Excellent photos and some are so funny. However one dog has to get its picture up front, so I picked Lockie just because he looks so proud to be in his antlers. houndy replied the topic: Re:Festive Hound Photos. My clever son did it as a screen saver for me and has managed to photgraph all my hounds with antlers on - no mean feat!! Last Edit: 10 years 3 months ago by houndy.